Quad-band GSM (850, 900, 1800, 1900 MHz), Quad-band 3G (850, 900, 1900, 2100 MHz), Penta-band 4G LTE (800, 900, 1800, 2100, 2600 MHz), Uses micro-SIM. 4.3” AMOLED, ClearBlack screen (480x800, 217 ppi), 16.7 million colours, Polarization filter, High brightness mode, Sunlight readability enhancements, 15:9 aspect ratio, RGB stripe. 1.5 GHz dual-core Snapdragon S4 chipset, 1 GB RAM. 8 GB internal storage, 7 GB in SkyDrive (online storage), 32 GB microSD slot. 8 mp auto-focus rear camera with Carl Zeiss Tessar lens, dual LED flash, F Number: 2.2, Focal Length: 28 mm. Camera Features: Touch focus, Landscape orientation, Geo-tagging, Auto and manual white balance, Still image editor, Lenses apps, True 16:9 sensor; Flash Modes: Off, Automatic, On; White Balance Modes: Cloudy, Tungsten, Fluorescent, Daylight. 1080p video recording @ 30 fps, Front 0.3 mp camera. NFC, Wi-Fi with hotspot an Channel Bonding (DLNA certified), Bluetooth 3.1, Assisted GLONASS GPS (with offline navigation support and voice navigation). Micro-USB 2.0, 3.5 mm audio jack (with Dolby headphone support), Noise-cancelling mic. Proximity sensor, Compass, Ambient light sensor, Orientation sensor. 1650 mAh battery, 14 hours talk time on 2G (8 hours on 3G), 330 hours standby time, 55 hours of music playback, 5 hours of video. Audio Formats: ASF, WAV, MP4, AAC, AMR, MP3, M4A, WMA, 3GP, 3G2, AAC LC, AAC+, eAAC+. Video Formats: MP4, WMV, 3GP, M4V, M4A, VC-1, H.264/AVC, H.263, MPEG-4. 4.9" (l) x 2.7" (w) x 0.4" (10 mm) (d), 160 grammes. Package Contents: AC-50N micro-USB charger, BP-5T 1650 mAh battery, Charging and data cable CA-190CD, Headset WH-208, Product user guide. 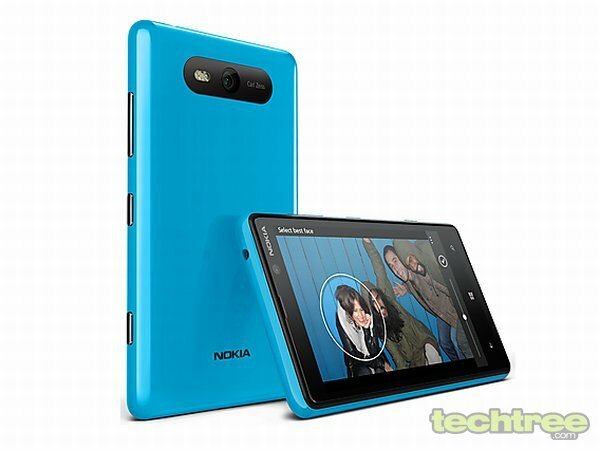 Similar to its flagship sibling, Nokia has placed special emphasis on the camera. One noteworthy feature is called Smart Shoot. It takes multiple images when the shutter is pressed, identifies the ones that have smiling faces and open eyes, then merges the photos to ensure that all subjects look their best. The Lumia 820 is also compatible with the newly-introduced induction charging pad accessories. It also boasts of interchangeable body panels in yellow, red, white, grey, cyan, purple, and black. If you get bored of your phone's colour, you can simply buy a new panel instead of trading the whole phone. As of this writing, Nokia hasn't shed any light on the phone's launch date and pricing. Don't forget to check out the gallery below for more product shots.